SASANE is a non-profit organization established in 2008 which is led by a survivor under the founding principle that women survivors of human trafficking have immense potential to combat the exploitation of Nepalese women and girls, and to create social change. Even though the organization is founded in Kathmandu, it has expanded to two offices and combined guesthouses for international volunteers in both Kathmandu and Pokhara and also broadened its reach to seven other mountain village areas. The interrelated programs (Paralegal, SOS, and School Awareness & Community Outreach) and four keys that have been created through an innovative strategy which combines paralegal training, small business development, school awareness, and community outreach. In an addition to other educational resources intended to empower female human trafficking survivors and girls at risk of being trafficked or re-trafficked. SASANE promises and works blood and sweat to be able to help every human and women, not missing a single rock to be unturned, from every cracks and crevices of the nation to be able to stop human trafficking. The organization strongly believe that every human trafficking survivor has as much of right if not more to get a chance to be able to achieve their individual dream and potential. The organization will train the survivor professionally and most important with endless love and support so that the survivor will be able to regain and be pack of self-esteem, have appropriate skills and necessary knowledge to be able to be a leader in their chosen field so that they can in future be able to do the same. Be able to help, educate and influence to the women around the nation. To be able to be that role model for all the women and human who is suffering from human trafficking, so that they will be encouraged to fight for their right, and have a place where they can be save and run to, be able to call it a home. Educating is very important for all the people who might be the next victim and who may be also suffering through the human trafficking that where to get help. How to prevent from being a victim, not to trust people when offered for money, how to be cautious and what to do when you are a victim. In an aim to seek to develop and implement programs to physically, emotional and financially rehabilitate female victims of trafficking and exploitation. 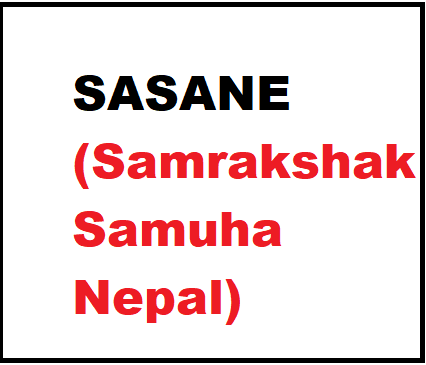 SASANE hopes and continues to be able to further develop its mountain village programming in order to extend its reach to rural women as well as also be able to expand and establish a third office in Biratnagar and Morang District. So that they can continue advertising and spreading the awareness through programs and education as human trafficking survivors have an immense potential to create social change, and, due to their experiences, which plays a vital role in eradicating human trafficking in Nepal. These interdependent programs assume a rights-based approach to break the cycles of exploitation and victimization, increase women’s access to justice, and reintegrate survivors into society as valued and respected member of their community. With the mission to end the physical and sexual exploitation of women and girls ensure their legal rights, and empower them to live free and dignified lives.